What’s good, what’s bad, what’s just plain ugly! So, to say sugar is the big bad wolf these days is an understatement. Do you crave sweets constantly? You are not alone! We all know that eating a ton of sugar is unhealthy, but why is it unhealthy, and what about all these sugar alternatives, are they any better? Let’s start at the beginning, just how bad is plain old table sugar and its sinister cousin high fructose corn syrup? I consider these guys cousins because they are both considered refined sugars (or rather processed sugars). In small amounts, refined sugars are not horribly detrimental to your health but the problem lies in the fact that it is quite difficult to limit yourself to just a little. High fructose corn syrup (HFCS) for example can be found in everything from beverages, salad dressings, to even bread. It is truly alarming; I was appalled when I went to buy a loaf of bread and when I read the ingredients, out of the more than 10 brands of bread, only ONE did not have HFCS in it. Refined sugars are so prevalent that it does get difficult to limit your intake unless you are vigilant. The sneakiest form of refined sugar is when it is present in a liquid. It's easy to double or triple the calorie count of your meal when you include sugary beverages. That high calorie count contributes to things like weight gain, insulin resistance, and an array of other negative metabolic effects. The last little tidbit about refined sugars I will mention is geared towards those folks that may have a lot of digestive issues. A high sugar diet can further gut dysbiosis (disturbance in the battle of good vs bad micro-organisms in your gut, dysbiosis means the bad guys are winning), so if you are trying to heal your gut, sugar is best avoided. Ok now let’s get to the good stuff, what about all those sugar substitutes? Are they any better for you? Some have a lower calorie count so they must be, right? The answer is not a simple yes or no. First, I will address the natural alternatives then I will jump into the artificial ones. Honey is by far one of the more common natural sweeteners around. While high amounts of honey can create problems for the same reasons as refined sugars, they do have a ton of health benefits. They contain enzymes, trace minerals, flavonoids (these can be anti-inflammatory and antioxidant), and can help with seasonal allergies if the honey is locally harvested. All these benefits are only seen with natural honey so skip on the synthetic brands! Honey will affect your blood glucose levels so if you are diabetic or sensitive to this use sparingly if at all. Stevia is another natural sweetener but this one tends to be clumped together with the artificial sweeteners because it contains almost no calories. Stevia has been used by various civilizations throughout history including the Guarani people of South America over 1500 years ago to sweeten tea and medicines. Stevia has very little effect on blood glucose so it is a safe alternative for sugar for diabetics and anyone who is looking to control their blood sugar. 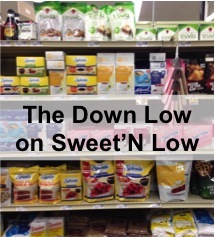 See the section labeled "Low/No Calorie Sweeteners" for one of the major drawbacks of Stevia. Ok so this brings us to all the artificial sweeteners (Sweet’N Low, Equal, Splenda, etc) I won’t spend much time here because the research is conflicting. In rat models a lot of these sweeteners induced cancers, fertility issues, diabetes and overall health issues, but it is very difficult to recreate these studies with humans. This means that there is not much proving that these sweeteners are dangerous but that may only be because studying aspects of human diet is a very tricky thing. In this department I would rather be safe than sorry. Honestly, my opinion is stay clear! If you have blood sugar issues stick with Stevia, but as I will explain below, stevia is not without its risks so don’t get too carried away. If you are reading labels and you see xylitol or sorbitol, these are sugar alcohols. They are low calorie sweeteners that do not seem to affect blood sugar levels, so this is a good alternative for diabetics and anyone else who is concerned with their blood sugar levels. If these are consumed at a high level you may experience some digestive issues however, so again, don’t go nuts pounding back tons of drinks sweetened with xylitol thinking you are invincible. Your bowels will remind you that you are not! Not as many studies have been performed with sugar alcohols to determine if they confuse the body like other low calorie sweeteners but it is generally thought that since they are not as sweet as some of the others, that the reward/lack of suppression cycle that I will talk about next may not occur. Jury is still out though so keep that in mind. While Stevia does seem to be the best option for anyone with blood sugar issues, low to no calorie sweeteners can confuse your body. The following goes for all the artificial sweeteners as well. Going back to our more primitive days when we had to hunt and food was scarce, ensuring adequate calorie intake was vital to our existence. Our bodies have adapted to associate sweet taste with calorie dense foods. That happy feeling you get when you eat something sweet is related to dopamine. This is literally our body saying “hey, yea, that’s sweet so surely it will have tons of energy for us to use, so go ahead eat it and I'm going to reward you with happy feelings so that you will want to eat it again.” There is also an appetite regulating hormone called leptin that gets released that tells your body it’s full when enough calories have been consumed. So if you trigger both these to be released and actually do not consume a good amount of calories, your reward centers in your brain keep going off without your appetite ever being suppressed. You can actually trigger carbohydrate/sugar cravings to satisfy the calorie confusion your body is experiencing. This can set you up for overeating and obesity!! Moral of the story here is that low amounts of sugar/sweeteners are fine, but sugar is hidden in all types of food, making it difficult to keep your levels low. Moderate to high levels of sugar have been shown time and time again, through research studies, to be detrimental to your health. Start reading labels to see what type and quantity of sweetener is present. Try monitoring it for a day or two. See what you find out. If you don't mind sharing, I would love to know what you learn. Also, if you have any questions you can always email me at drkiradc@gmail.com.